We’re big fans of TerraCycle, the upcycling company that turns trash into trash cans, Frito-Lay bags into speakers, and snack bags into totes. The company’s wares can be purchased online and in select stores (i.e. Walmart) but up until now, there hasn’t been a one stop shop for TerraCycle goods. 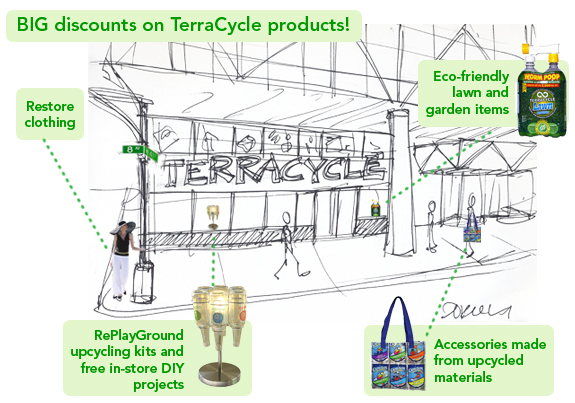 Enter TerraCycle’s pop-up Green Up Shop, now located in NYC’s Port Authority until May 1. TerraCycle’s pop-up shop may not be selling anything new, but its placement in Port Authority is the ideal spot to catch curious commuters who might otherwise never hear of the company, let alone the concept of upcycling. If you want to introduce your friends to the concept, consider taking them to the Green Up Shop on April 8th at 7 p.m., when Garbage of Eden and RePlayGround will offer a DIY scraptacular, complete with free scrap materials.